From pitfall trap place 11/IV-2/V/09. Interesting wasp Dennis. The sinuous, non-convex, leading edge of the wing, and its strange reduced venation seem very unusual for a sphecid, at least to my (perhaps under-experienced) eye. 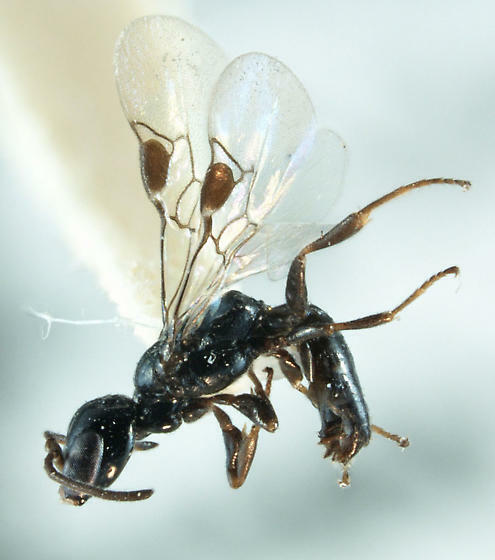 They're fascinating little wasps that hunt thrips. So they're often found hanging around small tubular pale flowers. I find them associated with Ceanothus, Phacelia, and Eriogonums frequently. They also seem to have an afinity for sandy soils. The males in this section of the Sphecidae often have strange clypeal shapes, with projections and teeth. To a thrips they are a tiger in wait!